Wild: the game starts when the tornado (wild) will only appear in the first three reel, tornado (wild) with alternative, can replace any symbol, including the Weathervane (scattered). - Whenever there is a tornado (wild) in the winning combination, wild will cover the entire reel before the prize is awarded. - When the Weathervane (scatter) 1 or more and tornado (wild) appear at the same time, (Wild) can only be a weathervane (scattered ) recorded 1 line points. Scatter : Weathervane (Scatter) pay are the total bet multiplied by the odds. - Each game must have 50 active payline. - up to 50,000 times the prize money. 9 free game are awarded when 3 or more scattered weathervane appear from left to right. Whenever the wild appear during free games, it replicate itself onto 1 and 2 additional reels before pays are awarded. The Win-Win Feature triggers when the overall win from the Triple Twister Feature ( excluding any initial trigger win) totals 10 times the triggering bet or less. * No win award, a prize of 100 times bet. * A win greater than 0 and less than or equal to 2 times bet awards a prize of 8 time bet. * A win greater than 2 times bet and less than or equal to 5 times bet awards a prize of 3 time bet. * A win greater than 5 times bet and less than or equal to 10 times bet awards a prize of 2 time bet. - Win-Win feature prize are awarded after the Triple Twister Feature end. 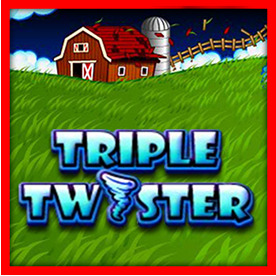 Progressive Jackpots in Triple Twister can be won at the conclusion of any game. The Jackpots are trigger at random. Progressive Jackpot wins are added to other wins. Random Jackpot contributions no more than 1.5% of total Return to Player.